It is now 2018 in Japan. 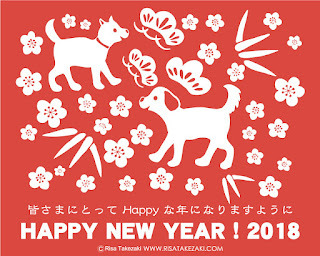 Because this year is "Dog Year", I drew dogs with lucky motif that are Pine, bamboo, and plum. I registered "30 paintings in 30 days challenge" today. It is scheduled to start in February. I do not know if I can paint thirty pictures, but Many artists from the world are always participating in this challenge, so I am sure that is a lot of fun. I have not written this blog for a long time. I noticed it today! I will make efforts to write this blog more frequently this year!